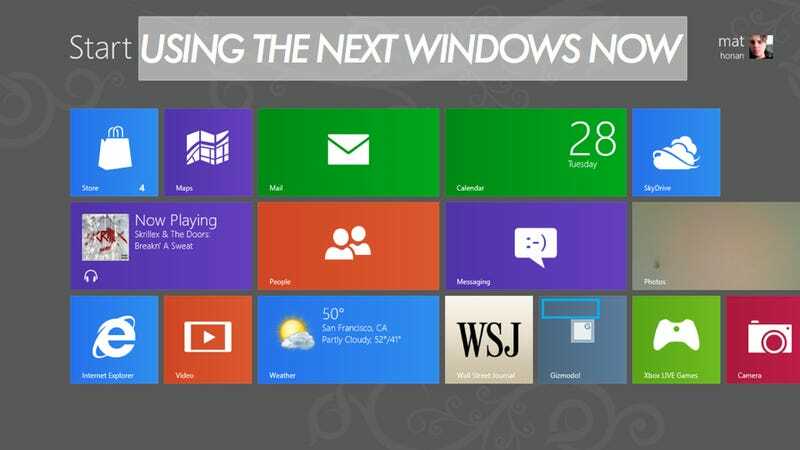 The beautiful Windows 8 Consumer Preview is upon is, and although it's not the final version, it's getting close. This isn't just for developers—it's for you. So get downloading and start using Microsoft's amazing new beginning. Are you already a Windows diehard? Or an Apple user, looking to see how the other half lives? Either way, we've got you covered like a thick flannel blanket. Made out of preview software. You can do that riiiii-iiight here. Then you need to put that file on something you can install it with. That means either burning the ISO disc image to a DVD or copying it to a USB flash drive. A little annoying, but that comes with the territory when installing a separate operating system. Whether you're using Windows or OS X, this feature is built right in. Are you on a PC? Once you've got the Windows 8 file, you'll want to install it alongside the current version you're using—this will allow you to dip your toes in without committing, but requires some minor hard drive futzing. Open the Start Menu and right click on the "Computer" option. Click "Manage", and in the window that appears, click on "Disk Management" in the left sidebar. Find your system hard disk in the graphical list that appears in the bottom pane. Right-click on it and then click "Shrink Volume". Shrink it down so you have at least 20GB of space left on the end of the drive, and click OK. Then, click on the "Unallocated" block of that drive that appears and click "New Simple Volume". Click Next on the next few windows until you get to the "Format Partition" window. Here, give it a volume label you'll recognize (like "Windows 8") and click Next. It should format the drive for you. Now you're all set to install Windows 8. Your PC will now boot into Windows 8 by default, but if you want your previous version to auto-start, go to "Change Defaults or Choose Other Options" from the Windows 8 boot menu. You've now got a two-headed computer. Taking your Apple down the Windows trail is a little bit more complex, but not enough to keep you from going nuts. Apple has a special tool to get Windows running on your computer—Boot Camp. Guess what! It's already on your computer: Applications > Utilities > Boot Camp. NOTE: We're encountering some problems at the office trying to get Boot Camp to create a Windows 8 installation flash drive via MacBook Air. It's possible the method that worked for the Developer build won't work for the Consumer Preview. We'll keep you updated. Pop that open, click Continue, and select "I have already downloaded the Windows support software," create a partition for Win 8 (Boot Camp will divvy off a chunk of your hard drive for you), and then Boot Camp will walk you through the rest like installing anything else (watch this video from 3:00 onward if you need visual guidance). We promise it's an easy step. You'll automatically boot into Windows, but hold down the option key on your next restart to switch operating systems. You're now using Windows 8. Tell us what you think. But remember: not only is this a beta product several months away from release, it's also dramatically different from any operating system you've used before. So proceed with the knowledge that you'll volunteering to be Microsoft's guinea pig.